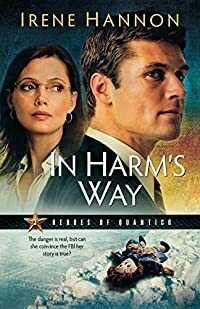 In Harm's Way is a strong novel of romantic suspense, mostly due to the well drawn and appealing characters of Nick Bradley and Rachel Sutton." > In Harm's Way by Irene Hannon, a Mysterious Review. Review: Irene Hannon's "Heroes of Quantico" series continues with FBI Special Agent Nick Bradley skeptical of a woman's story about a discarded Raggedy Ann doll … until he discovers it may be a clue to the disappearance of an abducted child from Chicago in In Harm's Way. Nick had heard Rachel Sutton's story before — at least a variation of it from any number of people who had come to the Bureau with "feelings" about things they had found. But Rachel was different. Well educated and successful in her career, she was not typical of the "off-the-wall" general public who frequently show up with stories to tell. It was a warm February in St. Louis, she says. She had stopped at a take-out restaurant to pick up dinner, parking in the last spot near the dumpster. Snow was on the ground but beginning to melt. Returning to her car, she notices a warn, dirty, but probably well-loved and deeply missed doll with a patch over one eye peeking up through the snow. As she was digging the doll out, she was blindsided by a sudden rush of adrenaline. Her pulse rocketed and the world seem to be twirling around her. Her whole body began to tremble and the doll skipped from her grasp and fell to the ground. What had happened? Her reaction to holding the doll was nothing short of terror. But upon looking at it again, she felt warmth. She has brought the doll to Nick who, after politely listening to her tale, tells her he would check to see if it had been reported missing. More curious than anything else, he does just that … and sets into motion a series of events that ultimately puts Rachel's life in danger. In Harm's Way is a strong novel of romantic suspense, mostly due to the well drawn and appealing characters of Nick Bradley and Rachel Sutton. The course the plot takes is reasonable and believable; an overheard conversation in a restaurant that leads to unwanted publicity for Nick's nascent investigation and for Rachel, who is deemed a psychic in the press, a key turning point in the story. Their developing relationship is touching, two independent individuals finding that their lives are richer because they have found each other. It's all beautifully done, and In Harm's Way is a book well worth reading. Special thanks to guest reviewer Betty of The Betz Review for contributing her review of In Harm's Way. Acknowledgment: Baker Publishing Group provided a copy of In Harm's Way for this review.